Chris Wall is one of the many trainers who calls Newmarket home. Averaging a little over 200 runners each year, Wall definitely has to be considered one of the shrewdest handlers in the industry. 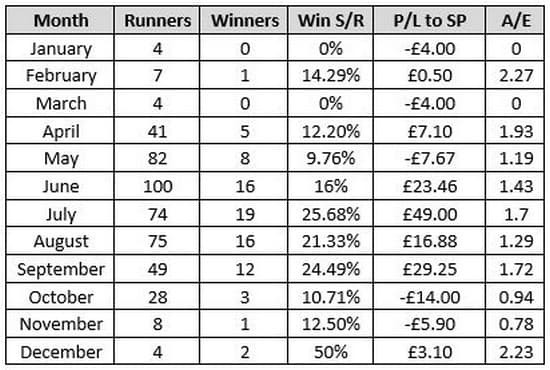 His strike rate is approaching 14% and his runners regularly provide value at their odds. Is there any time when Wall’s runners do better than others? How do they fare on the back of an absence? We find all the answers out. His horses off for 150+ days do slightly worse than they should do based on odds. Yarmouth in particular, is one of his local tracks, and his strike rate, profit and A/E are fantastic at the seaside course. The only track where Wall displays a real weakness is Ascot, where his runners are 2/76. This can be expected to an extent, as most of the races run at the track (particularly during the Royal Meeting) are very competitive. Chris Wall is a good judge of a horse, and a solid race reader. 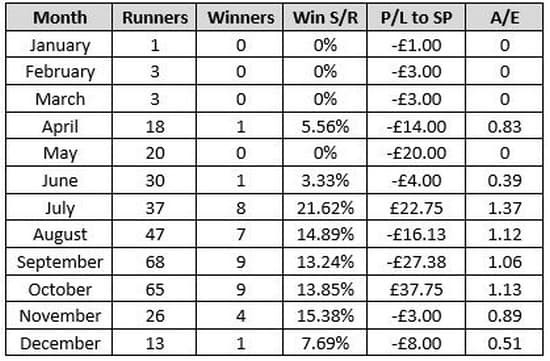 He rarely leaves the money behind more than once, and has one of the best records in the industry with his horses who were beaten favourites last time out; 61/235 (25.96%) for £142.93 LSP, A/E 1.52. Some punters advocate laying horses who were market leaders last time out, as they can be over bet again (this strategy isn’t backed up by data); in this instance it would be the quick way to the poor house. Chris Wall’s last time out beaten favourites should be backed next time they run. Chris Wall’s 2 year olds can generally be avoided on their first and second starts. They represent poor value. A similar story applies to his first time out and second time out 3 year olds. Their strike rate is poor. 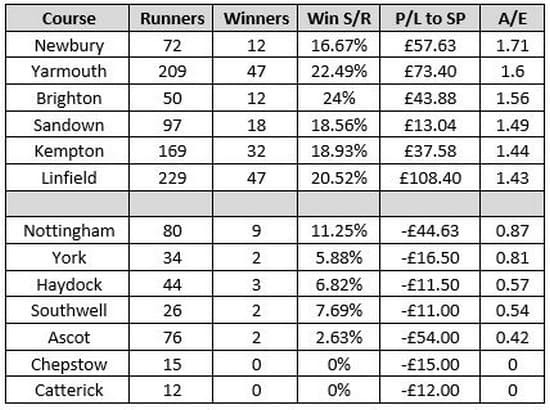 Wall’s 3 year olds moving from maiden to handicap company after 3 starts are usually well in and are very profitable. His 3 year olds in 3 year old+ handicaps have a terrible record in the first 6 months of the year. Their strike rate and returns improve after June. Newbury, Yarmouth, Brighton, Sandown, Kempton and Lingfield are tracks that Wall excels at. He has a moderate record at Ascot. Chris Wall’s horses who were beaten favourite’s last time out have a superb record next time. They don’t leave the money behind twice in a row. When Wall uses claiming jockeys, they are usually very competent and good value for their claim. Backing his horses blindly with a claimer on board is a profitable strategy.